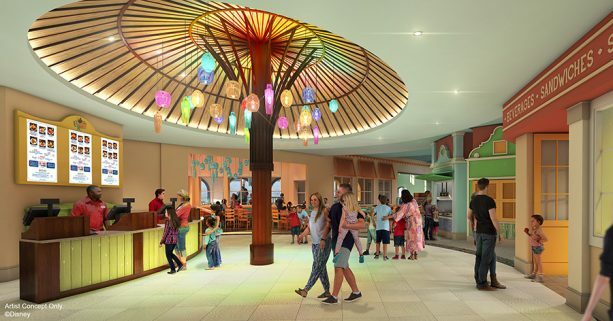 While we’re waiting for the new dining options to open at Disney’s Caribbean Beach Resort, Disney has announced new details for the waterfront dining and the updated quick service restaurant. 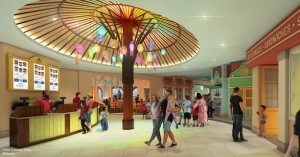 Guests will enter the area under a palapa-like structure and the area will feature “open shutters, wooden light posts, awnings, ornamentation and unique seating areas.” Grab and go items will also be available. The new table service restaurant – replacing the former Shutters – will be called Sebastian’s Bistro. This new restaurant will be located on the waterfront at Caribbean Beach Resort and will feature “a menu that blends Latin and Caribbean flavors from market-fresh ingredients.” Sebastian’s will be a casual, family-friendly restaurant. There is no official opening date yet for either location.